Amidst the chaos that is my life, ensuring I leave work on time, picking up my kids from their grandma and driving home - means I only have about half an hour to forty-five minutes to make my kids' dinner. So, healthy and quick (and homemade) dinners are essential. A lot of my friends ask me sometimes how I can manage, and honestly, I don't even know. But, I do spend a few minutes just thinking of new and fun ways to feed the kids their dinner. I buy ready-made store-bought crusts, use some homemade frozen tomato sauce (recipe to be posted shortly), and have the kids sprinkle mushrooms, olives, and cheese. They LOVE smiley faces. Pop it in the oven for about 20 minutes and you have yourself a healthy delicious dinner. This is so simple that anyone can make it - even Dad. Crack 2 eggs in a pan with some melted butter, add a dash of milk, a bit of salt and a dash of parpika. Scramble till, well, scrambled. 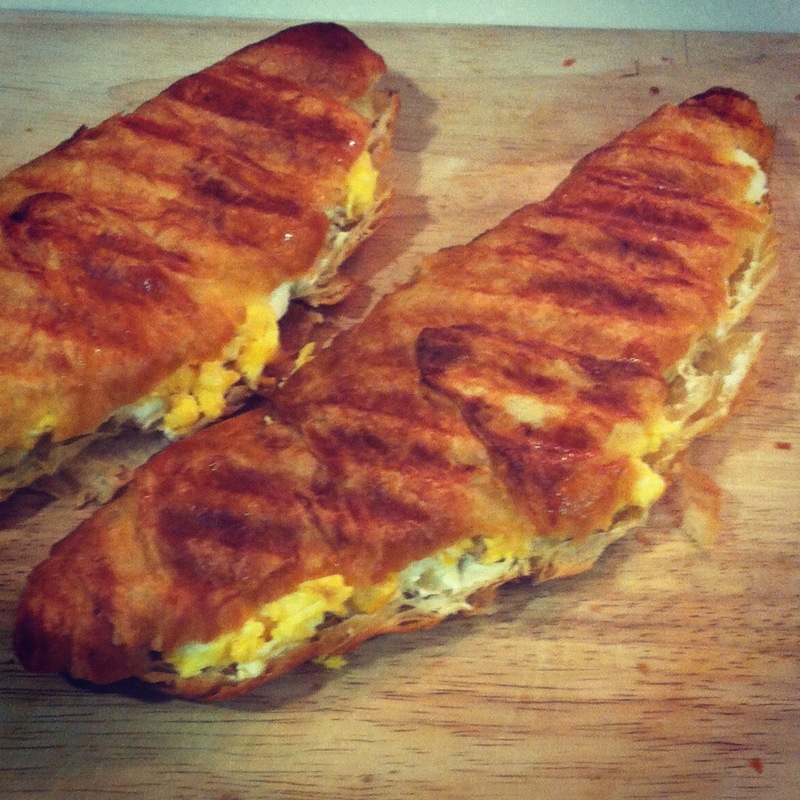 Slice open some croissants, layer with not-so-sharp cheddar cheese (available at most delis), or even cream cheese, and pop in the press for around 4 minutes. I slice them into chubby-lil-hands-sized pieces and my kids LOVE LOVE LOVE them. Nuggets and fries have some sort hypnotic spell on kids with a 100% guarantee that they will gobble them up. I don't mind treating them to good ol' Mc D's every once in a while (emphasis on while) but the home-made version is super easy and guiltless. I use fresh chicken breast, cut up in strips. Season with salt and a bit of pepper. Dip in beaten eggs, shake off, and then dip in homemade breadcrumbs, press to ensure breadcrumbs stick. Lay on parchment-paper-lined cookie sheet and bake with freshly-cut potato wedges or sticks. (To make homemade breadcrumbs, I use stale bread, bake it till it's golden crispy, cool it, then zap it in the food processor till it's in sand-like form. I use what I need and freeze the rest). This tomato sauce is so delicious and so easy, you'll want to make it batches and freeze it. I usually do that when I have tomatoes that are too soft for salad. Take 3 large tomatoes, chop them up real small and pop them in the saucepan over medium heat. I don't even use oil here but if you are a fan of olive oil, then by all means drizzle some in. As the tomatoes cook and soften, sprinkle in some cumin, salt and a dash of pepper. Throw in 1 vegetable stock bouillon. Cover and let the whole concotion cook for about 20 minutes. Towards the end, sprinkle in some fresh cut parsely and cook for an additional 5 minutes. Depending on your preference, you can add a teaspoon of tomato paste. I like my sauce as it is. If the kids are having pasta then I leave it chunky. However, for pizza sauce, pulverize the heck out of it, and spread it on the pizza crust. My kids get super-excited when they see me making these. These are so easy to make and my 4-year-old likes to help roll the 'thothij'. Simple puff-pastry thawed and brought down to 'almost' room temperate - just until it's pliable. 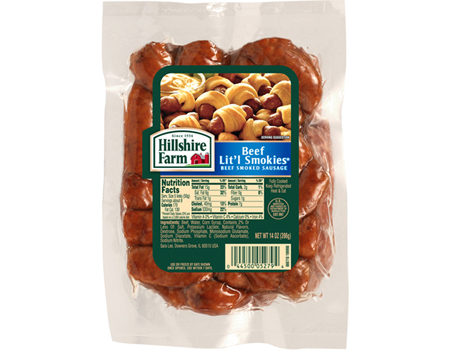 I use Hillshire Farms Lil Smokies Sausages (available in Alosra and Aljazira). I assemble the puff pastry, sausage, a small squirt of ketchup and I seal the pastry dough with a bit of water. Pop it in the oven for about 20 minutes and they're done! Perfect for cocktail parties too! Soooo, in a nutshell, if you don't have any time for a quick and healthy dinner - think again. Most of these recipes need 20 minutes or less. Everyone's got 20 minutes right? Don't forget the cow and the banana!